I think more of you have emailed me about this than about anything else that anybody has ever done with a Raspberry Pi. What you’ve just looked at are, we think, the highest ever photographs transmitted live from an amateur device in the UK world. 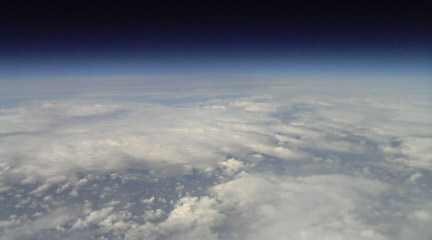 Dave Akerman hooked a Raspberry Pi with a webcam and GPS up to a hydrogen balloon, which got nearly 40km up (39,994m, to be precise) before bursting. 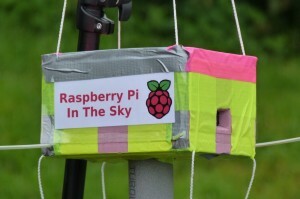 This means that Dave’s is the first Raspberry Pi to visit near space (it returned unharmed, and Dave was able to recover it), and also means that Eben does not have to eat that hat he mentioned. "And if you introduce a lighted spill to the neck of the test tube..."
If you want to learn more, visit Dave’s blog, where he has documented the flight minutely, to find out how he did it. 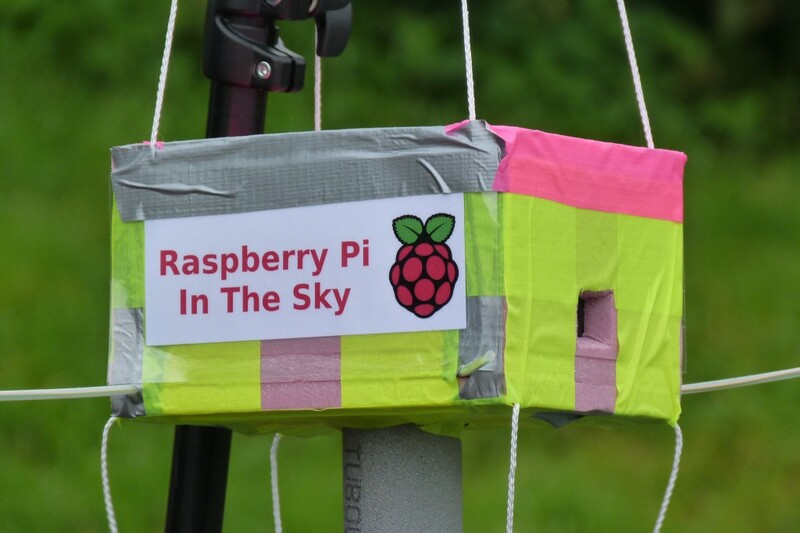 He’s also put up a couple of Flickr sets: one full of images sent from the Raspberry Pi on its journey, and one of photos from the ground. Here at the Foundation, we’ve been reading his page on the project over and over, jaws on the floor. Well done Dave. We’re sending you a big virtual round of applause. TheRegister will be all over this! Looks like a much more interesting (and cheaper) method than their ‘LOHAN’ and ‘PARIS’ launches – though PARIS did produce some fantastic photos! Finally a post about this great project! I think this video is missing here, can you add it Liz? 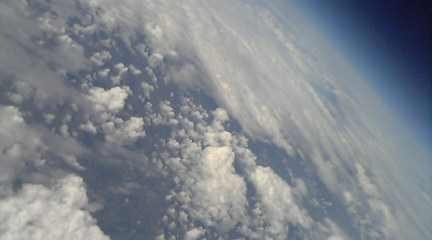 That video, sadly, wasn’t taken with the Raspberry Pi, but with a GoPro Hero 2 camera (attached to the same balloon), which is why I haven’t included it in the blog post. I’m thinking about things to add for the next flight, and having the Pi take video footage (possibly using a second webcam, or that new camera) is on the list. The camera board would be a good option; it’s very light. I remain pathetically excited about the whole thing; please mail me next time you try something! 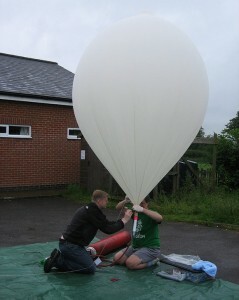 Dave, just contact us before you send up your next balloon. Even if there is not yet an official camera, we might be able to have enough trial SW so we can lend you our 14MP prototype. (And yes, at the moment there is only ONE prototype). Also I am looking at reducing power consumption by (hopefully) 40% so you can use smaller batteries. great project, very inspirational! But my reading of the writeup is the Pi’s GPS got stuck at the launch location, and they got the GPS location readings from one of the other two packages on the string. Correct. My fault – I knew from testing I had to keep the GPS receiver away from everything else. After assembling the payload it got a lock very quickly, but I should have checked afterwards that it hadn’t lost it. A friend (Anthony, who launched with me) is designing a PCB now to hold the GPS and radio, with options for SPI and one-wire sensors. That will connect to the Pi via a ribbon cable, and it will have a much better GPS receiver, so this issue will disappear. Given the comment about heat build up inside the R-Pi package, also thinking about a bimetallic strip (simple thermostat) to open a window for cooling as needed. Very good – off topic slightly, but you need to laugh now and again – Bookmarked! In fairness to my better half Julie, who took the video, it did help get that long flight train in the video. LOL at the YT video BTW. I watched this from a link in the earlier thread and was impressed, though one thought crossed my mind – do you need to get air clearance to launch one of these balloons? Then whilst watching the embedded video an aircraft can quite clearly be heard flying over – I would hate to think what damage a balloon sucked into a jet engine could do! I know it says hydrogen in the into from Liz, but I watched the video yesterday and I’m sure it was mentioned that it was helium. It was hydrogen, and the Hindenburg disaster was not a fault of the hydrogen. Wasn’t it to do with the lacquer they’d used on the shell? Fascinating stuff (and ruined hydrogen, which got the blame, for everyone else). Yes, I did the 3D animation for Rolls Royce when they launched the Trent engine (many moons ago…), and they even go to the lengths of shooting them the right way round so that the breast bone goes in first as it’s the hardest part. Yes, the Android thing was an interesting project, though phones didn’t really do much themselves – the tracking and photography were done by other devices. The video where an Android toy robot gets sent by a flailing nylon cord to its doom is a classic. Well done Dave an excellent achievement. It’s altitude plus live photos that we believe Dave now has the record for. Not many people have done that yet, because until now it’s not been easy to do it cheaply. Exactly so. Previously I’ve flown Arduinos but you can’t plug a USB webcam into one of those. You can get serial cameras but one of those is twice the price of a Pi, and then you have to find a processor with enough power and memory to do the conversion from jpeg to the download format. The highest transmitted images previously worldwide were at about 35km (a flight in Holland), so unless there’s a flight I’m not aware of then the Pi got the highest transmitted images by 5km. Just out of interest, would a significant weight reduction in the payload have an impact on altitude? I’m thinking heatsink/battery weight – we’re wondering if there’s anything we can do to help you go higher. My switched-mode power modules arrived today, and they will help on that side. When I get time I’ll do some tests to see what I can get the batteries down to. Every gram costs (depending on who you believe) 1 – 3 metres in altitude, so the odd few grams here or there don’t make an awful lot of difference (says the person who missed the record by 82m!). There’s no doubt that a Pi could be flown a lot higher than 40km – remember that that was achieved with a medium size balloon and 2 other payloads hanging below! Not quite the record, but a great achievement. Reading this with great interest (at work ;-) and radio starts playing Star Man by Bowie. Nice coincidence. I still haven’t found time to get the 2 buttons and some LED’s system going – I have a long way to go I think. How were the images transmitted live? By what means? Using 300 baud rtty over a 10mW 434.65MHz radio link to a network of enthusiasts each using an amateur radio receiver hooked up to a PC to decode the signals. The entire infrastructure was built by other enthusiasts in the UKHAS group, including students at the Cambridge University SpaceFlight and Philip Heron who wrote the code to encode and decode the image data, and I’m indebted to all of them. 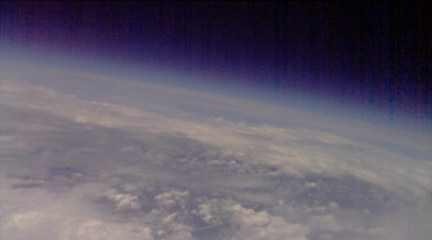 More details on the image encoding at http://ukhas.org.uk/guides:ssdv and in the tracking system in general at http://ukhas.org.uk/guides:tracking_guide. An alarming lack of basic physics/maths knowledge displayed by these two. Always climb a gate at the hinge end. Principle of levers. I’m guessing there was a good reason for not just opening it. The gate lock is jammed and doesn’t open. how does the raspberry pi transmit data?